Hafezieh Mausoleum is the closest to the town center. Built in 1953 in a garden, the mausoleum is a small open pavilion; inside which is a marble tombstone with several of the poet‘s verses. 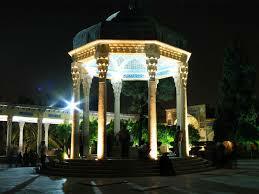 One of the nicest tea-houses (chaikhaneh) in Shiraz can be found in the grounds, set around a rectangular pool. You can sit around on cushions sip a cup of tea, or rose water while reflecting on his poetry. Hafez spent most of his life in his native town and died there in 1389. He is considered the undisputed master of the ghazal1, and his poems reflect richness and a subtlety unequalled even by the other great talent.